..open all year around and a guided tour will be given. Teas, coffees or lunches can be arranged as well if requested. ..Open from 9am to 1pm each day on dates below. Also at other times but appointment necessary. If the main gate is closed please try the next entrance along the road. Toilet facilities available. The garden is very accessible for disabled and one motorised buggy can be made available if requested. 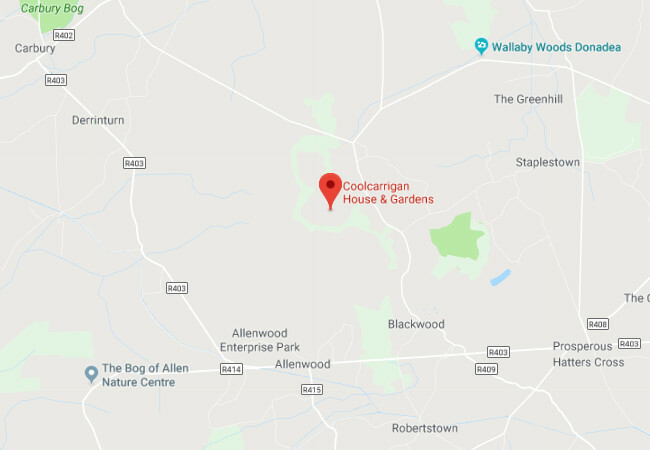 The house is located between Maynooth and Naas in Co Kildare. It is approximately 26 miles from Dublin, with a journey time of between 45 minutes and 1 hour.